Mikaela Shiffrin joins Bode Miller and Julia Mancuso as the only Americans with a medal in each of at least 3 Alpine disciplines. JEONGSEON, South Korea — Mikaela Shiffrin already was assured of earning her third career medal, each in a different event, when Lindsey Vonn prepared to propel herself out of the starting gate as the final starter in the final race of her Olympic career. With the snow descending under the artificial lights lining the course, the drama quickly dimmed. Vonn’s slalom lasted all of about 10 seconds before she went off-course, leaving Shiffrin in second place Thursday between two women from Switzerland: gold medalist Michelle Gisin and bronze medalist Wendy Holdener. Gisin, whose older sister Dominique tied for first in the 2014 Olympic downhill, produced a total time of 2 minutes, 20.90 seconds that was 0.97 seconds better than Shiffrin’s. Holdener was nearly 1½ second off Gisin’s pace, turning in the fastest slalom after standing 10th after the downhill. 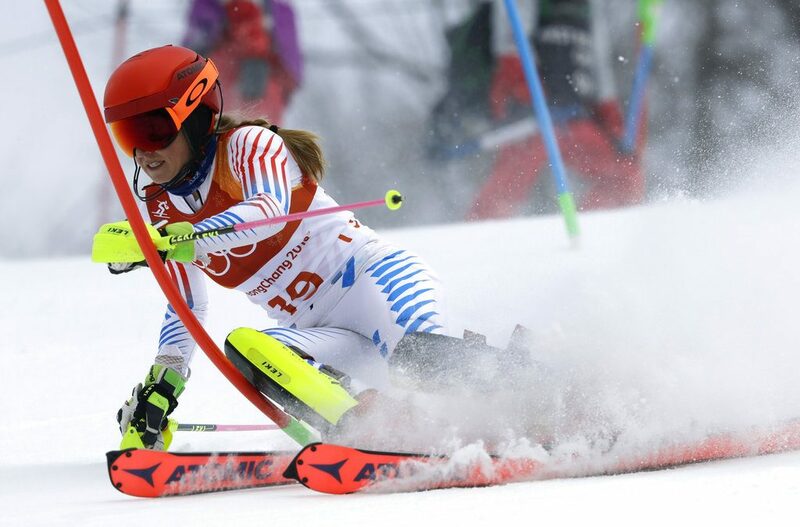 Shiffrin ranked sixth in the downhill, 1.21 seconds slower than Gisin, and wasn’t able to make up that large a deficit in her forte, the slalom, which was a much shorter track. The downhill took about 100 seconds; the slalom about 40. Silver medalist Mikaela Shiffrin celebrates during the flower ceremony after the women’s combined at the 2018 Winter Olympics Thursday. Still, Shiffrin added the combined silver to her giant slalom gold from a week earlier, giving her two medals — plus a surprisingly low fourth-place finish in the slalom — in three races. She arrived in South Korea to chatter about entering five, but after a series of weather-related schedule changes, wound up dropping two. Eight years ago, it was Vonn who went to the Vancouver Olympics accompanied by outsized anticipation and unrealistic speculation (by others) about four or five medals. She, too, came away with two, then missed the Sochi Olympics after tearing knee ligaments. At what she has said must be her last Olympics because her oft-injured body cannot endure another four years, Vonn added a bronze on Wednesday in the downhill, one of the races Shiffrin elected to skip to conserve energy. 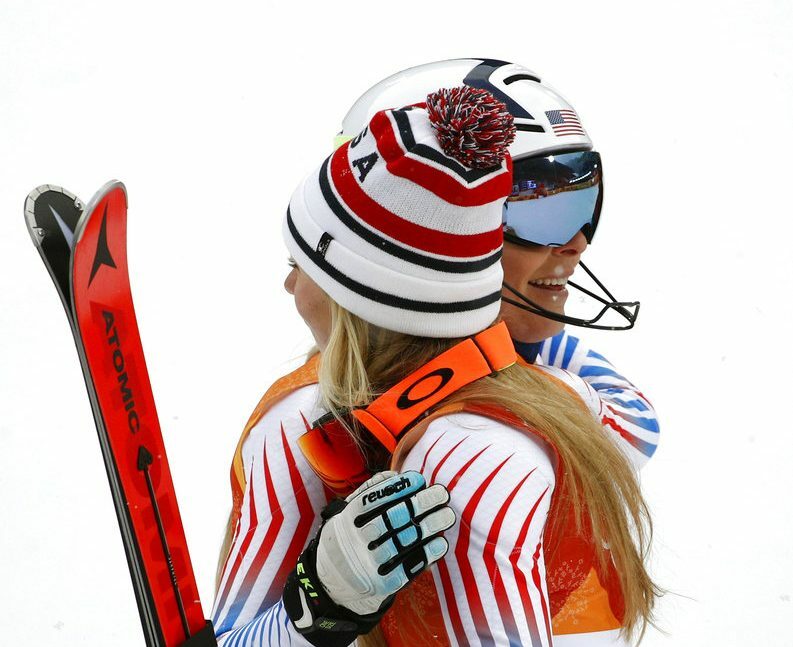 Mikaela Shiffrin, foreground, and Lindsey Vonn embrace after competing in the women’s combined slalom Thursday. Neither can possibly know what the future will bring, of course.